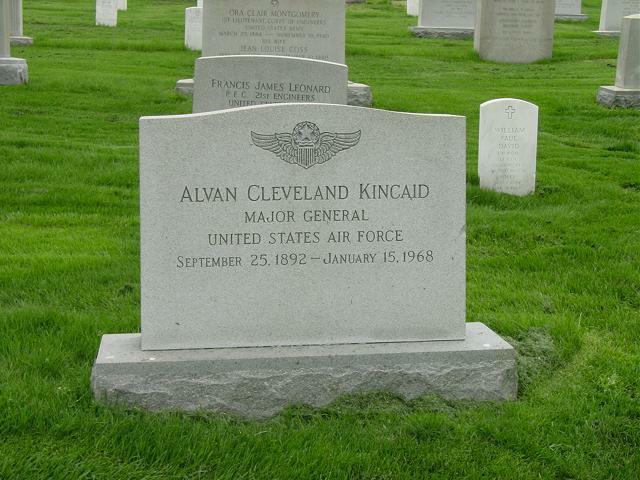 Alvan Cleveland Kincaid was born at Orleans, Indiana, in 1892. He graduated from Franklin College in Indiana in 1915. In November 1917, he was commissioned a First Lieutenant in the Infantry Reserve and assigned to the 336th Infantry, with which he served at various stations in the United States. He went to France in August 1918, to serve as an aerial observer with the 91st Aero Squadron, and later transferred to the 88th Squadron of the American Expeditionary Forces. During that time he participated in the Meuse-Argonne Offensive and the occupation of a defensive sector. He returned to the United States the following July and became an observer at Kelly Air Force Base, Texas. Later he served as assistant adjutant of the First Surveillance Group at El Paso, Texas, until April 1920, which he was named Air Service supply and transportation officer at Fort Benning, Georgia. Three months later he received his Regular commission as a First Lieutenant of Air Service. In November 1921, he went to Maxwell Air Force Base, Alabama, where he served as post adjutant. The following year he attended the Air Corps primary and advanced flying schools, receiving the rating of airplane pilot, and returned to his former position at Maxwell Air Force Base. He became commanding officer of the 43rd School Squadron at Kelly Air Force Base in September 1925, and in March 1927, was named post adjutant and instructor at the Air Corps Primary Flying School at March Air Force Base, California. In November 1929, he was appointed director of training at the Air Corps Training Center at Duncan Air Force Base, Texas. He went to the Panama Canal Zone in June 1931 and was named commanding officer of the 24th Pursuit Squadron at Albrook Air Force Base. A year later he transferred to France Air Force Base, also in the Canal Zone and served there as adjutant of the Sixth Composite Group. The following May he became commanding officer of the Seventh Observation Squadron at that station and a year later returned to the United States. In August 1934, he entered the Air Corps Tactical School at Maxwell Air Force Base, Ala., from which he graduated the following June. His next assignment was as chief of the school section of the Training and Operation Division in the Office, Chief of Air Corps, at Washington, D.C. In July 1936, he was appointed chief of the training section in that division. He entered the Command and General Staff School at Fort Leavenworth, Kansas, in September 1938, and graduated the following June. The next month he was ordered to Chanute Air Force Base, Illinois, where he became executive officer of the Air Corps Technical School. In July 1941, he was named assistant commandant of that school. He became project officer at the Air Corps Training Center at Moffet Air Force Base, California, in September 1941, and that same month was appointed commanding officer of Roswell Air Force Base, New Mexico. In March 1942 he was named commandant of the Air Corps Advanced Flying School at Roswell. He returned to the Air Corps Training Center in November 1942, and served there as assistant chief of staff for operations until the following February when he assumed command of the 37th Flying Training Wing at Luke Air Force Base, Arizona. He went to France in March 1944, to serve with the Ninth Air Force, and was appointed commanding general of the 84th Fighter Wing. The following month he was named chief of staff of the Ninth Tactical air Command in that theater and a year later became deputy commander for administration of the Ninth Air Force. In July 1945, he became chief of staff of the U.S. Strategic Air Forces in Europe. He returned to the United States in April 1946, and was appointed chief of staff of Air Training Command, with headquarters at Barksdale Air Force Base, Louisiana. In August 1948, he was assigned to the 20th Air Force at Harmon Air Force Base, Guam, and shortly afterward was appointed its commanding general. He remained in command when the 20th Air Force was moved to Kadena Air Force Base, Okinawa in May 1949. He returned to the United States in July 1950 to assume command of the Fourth Air Force at Hamilton Air Force Base, Calif. He became vice commander of Continental Air Command at Mitchel Air Force Base, New York, in January 1951. General Kincaid has been awarded the Distinguished Service Medal, Silver Star, Legion of Merit, Bronze Star Medal, Purple Heart and Commendation Ribbon. His foreign decorations include the French and Croix de Guerre with palm; the Belgian Order of Leopold II and Croix de Guerre; the Luxembourg Order of Adolphe and Croix de Guerre, and the Chinese Special Necklace, Cloud and Banner. A man of medium build, standing five feet, nine inches, and weighting 155 pounds, General Kincaid spends much of his free time playing golf.